Spicy Olive & Green Onion Pizza! Spread sauce on your crust. Sprinkle crushed chili pepper over the sauce (skin + seeds). Wash and slice tomato thinly - lay down a few slivers over sauced crust. Finely mince or crush a little basil and sprinkle over the surface. Slice green bunching onion (scallion) on bias and spread over base - reserving a few slices of green shoots to put over the cheese. 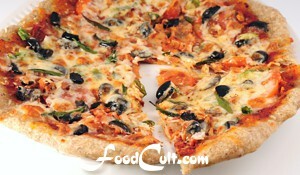 Cut olive pieces from the stones and spread over pizza. Reserve a few pieces for the top. spread a thin layer of shredded mozzarella. Top it off with the reserved bit of bunching onion and olive pieces. Place your pizza on the hot pizza stone (or on a cookie sheet and into the hot oven). Pizza is such an adventure. In our home town we found a pizzeria which made some wonderful combinations. One of our favourite was this one ... a particularly spicy pizza with a bright, fresh flavour - modified, of course, to our tastes. This particular pizza is nicest on a thinner crust (rather than deep-dish, for example). It works very nicely on light whole wheat, a regular white or even a sesame crust. We wouldn't put it on a full whole wheat as the dough would, in our opinion, overwhelm the delicate flavours of the toppings. The challenge with this particlular pizza pie is getting the spice just right. This pizza depends on crushed (not ground) chili peppers so as often as not, it comes out a little too spicy or a little too mild but it's always wonderful. The flavours are subtle - not too much of anything ... properly sauced, it takes a relatively small amount of thinly sliced tomato and herbs, a sensible amount of green bunching onion and just enough black olives ... no single element is overwhelming. Naturally, you my choose to add some grated romano or any other cheeses you like. We chose to keep it simple ... to take care not to build too many layers of flavours - to allow the natural flavours of the toppings to come through. The final result is a wonderful, light, spicey, fresh tasting pizza that doesn't leave you feeling weighted down.